The best hiking jackets are a great combination of fair price, good looks, and function. That's true of any of the best hiking clothing available today. Women's hiking jackets also need to fit differently than men's jackets, given our extra bits of anatomy up top. If you're wondering what to wear hiking when the weather calls for a jacket, here are some tips you can use to find exactly the best hiking jackets for your type(s) of hiking. Think in terms of your safety, comfort and well being when you're learning how to choose women's jackets for hiking. I've paid full price for two jackets many years ago, and am still wearing them for my extreme hiking adventures such as in Greenland and Alaska. They still keep me dry, which keeps me safe. Need another way to view this? Ask for these jackets as gifts! I'm sure someone in your life would love to watch your eyes light up when one of the best hiking jackets lands in your lap. Using this Arc'teryx jacket, I'll take you through some features to look for when you're in the market for a hiking jacket. Although this is a womens hiking jacket, all of these principles hold true for mens hiking jackets as well. The first thing to consider is how many layers of clothing you'll be wearing beneath the jacket. Don't have a hiking clothing layering system yet? Read this. While you're on the trail you'll be working up a sweat, and maintaining a higher body temperature than if you were lounging around at base camp or in your tent. Choose a jacket that accommodates the number of layers you'll be using, and realize that not every hiker will want to wear numerous layers. In fact, you might want a more fitted jacket to prevent wind and rain from blowing up your backside. This particular hiking jacket is a fairly roomy shell, allowing for layers beneath it without hindering your movements. This gear company also makes more form fitting versions like the Zeta. My recommendation is to always purchase a jacket with a hood, but look for the kind that tucks the hood away in a zippered pouch at the neckline. Another tip: The hood should provide an overhang, to keep rain and trail debris off your face. It can also shelter your ears and neck from the wind if snugged down tightly. Which length works best for you? Hip length will keep you drier, but will ride up a bit from your pack. This shouldn't be a problem if your backpack has a waterproof cover, and you're wearing rain gear. If you sit on cold rocks or soggy ground on your hikes, look for a jacket which will cover your backside regardless of how tall you are. A longer jacket will also be an advantage if you're hiking with a short daypack in wet conditions. Having said that, you do want your body heat to dissipate without creating an internal rain shower. Again, expect to pay for the fabrics which are breathable. The fabrics should also bend with you and create minimal noise, although there are degrees of success depending upon which blend of fabrics is used. If the sound of your pants swishing with every step drives you crazy, look for pants that are NOT made of nylon. Another tip: All points of regular wear and tear (wrists, neckline) should be reinforced, meaning the life span of this jacket is extended. You should also be able to make adjustments at the neck and cuffs, to follow the weather conditions and your internal temperature fluctuations. 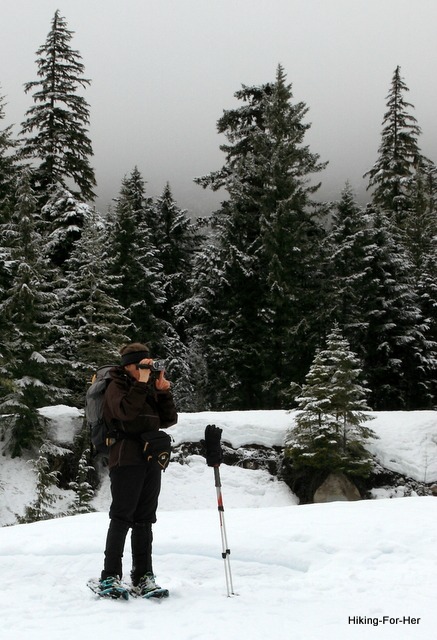 The best hiking jackets accommodate layers beneath them without hindering your movements. You want an easy up and down central zipper that won't get stuck or jammed when it's cold and wet and your fingers get clumsy. Two way zipper motion is a great feature (you can begin to zip it from top or bottom). You also want armpit vents, meaning zippers in your pit areas to allow body heat and moisture to escape. This allows you to regulate your body heat without removing the jacket. Some jackets also include short zippers on the chest area but offset from midline, another option for ventilation. Zippered pockets hold your gear more securely, and don't make the noise of a velcro closure. And it goes without saying that zippers need to be easy to access with a tab even with gloves on. That statement is true, up to a certain point. ...just to name a few of the brands I've invested in when shopping for weatherproof hiking clothing. The trick to avoiding sticker shock? Shop at the end of the season to scoop up deals. You'd be surprised how much of a discount you can discover with a little detective work. When my life does not literally depend on my jacket, I wear less expensive brands. I know that I won't get the same level of performance and durability, and I'm okay with that. Here's an inexpensive jacket that I love for its fit and function. Notice that it's made of water repellent polyester, has a hood, and is hip length. However, it's not heavy duty so it shouldn't be put in extreme conditions and expected to perform well over long periods of time. But, hey! 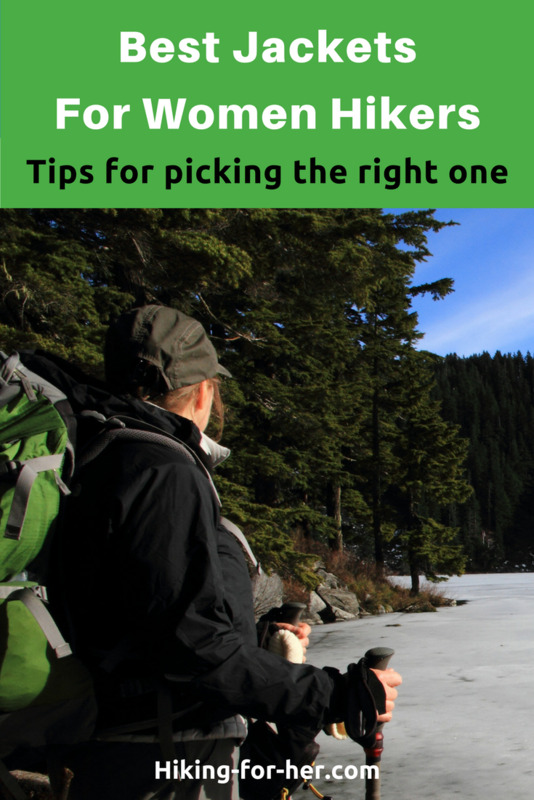 it's a fine choice for the "extra clothing" you should carry as part of your hiking ten essentials. And if I were to snag or rip this jacket, I wouldn't cry buckets full of tears like I would if my Arc'teryx jacket got trashed! Soft shell jackets like these will be a good choice for mild weather, and come in various price points. Take a look at the features of soft shell hiking jackets that I mention in a review here. If you're just starting out as a hiker or backpacker, don't spend a lot of money until you've decided which type of terrain and climate you want to explore. You'll soon build up a gear locker filled with the best hiking gear for your particular needs. Always look for versatility and durability. Remember that these 2 attributes are well worth the money. Now you're ready for your quest for the best hiking jackets! Or maybe you need some more tips on finding the best women's athletic clothing for hiking. Want to create a small miracle? Use my links to purchase your gear, and a very modest amount of money flows to Hiking For Her to maintain this site. It costs you nothing extra to be a miracle worker. Your support is deeply appreciated, thank you.